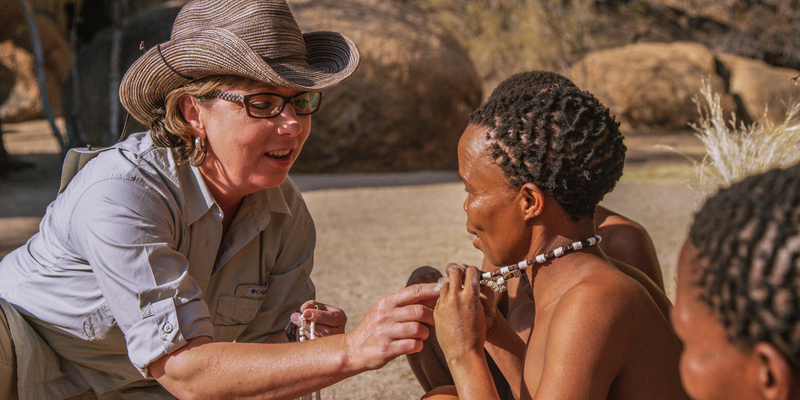 In the summer of 2015, Laurel was invited to participate in a safari to Namibia. This enabled her to experience the San Bushman culture from hunting and making fire the ancient way with the men to working alongside the women as they created disk-shaped beads of ostrich egg shells, then incorporated the results into their artfully-crafted jewelry. Her Namibia experience rose from Laurel’s desire to understand how what we term “primitive” cultures use and speak through their art, and why they seek to do so. She seeks to understand the mind of the ancients through the art they left behind. Why did the ancients paint the way they did? What does it tell us about them? 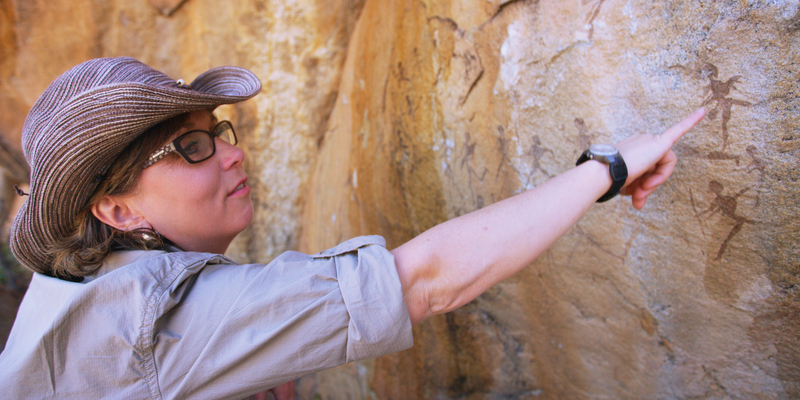 Prior to her visit to Namibia, Laurel had thought that the apparent distortions in the local rock art paintings reflected the way the Bush people at the time wore their hair or a headdress of some sort. But during an early evening walk through the Namibian bush lands with two of the local men, Laurel began to think differently about this. “The sun was low in the horizon as July is their winter,” Laurel explains. “It cast elongated and distorted shadows of the two men as they walked across the coarse, light colored soil. These distortions affected the look of the small flap of fur worn over their buttocks as well as the shadow-shape of their heads. I realized that what I had thought was a strangely shaped head in the pictures was actually a highly-accurate reflection of what the artists had observed—what he saw in his own shadow.” This realization changed Laurel’s perspective on the many paintings she saw at first hand in Namibia.